There are two things to do on 30th April Sweden, and in Gothenburg there are three things. The one thing is not to change your daily routine and carry on as normal. This is likely to be an easy option as long as you stay out of most population centres and away from schools and parks. The other thing is to really get yourself involved in Swedish society. Find out where the spring songs are going to be sung. 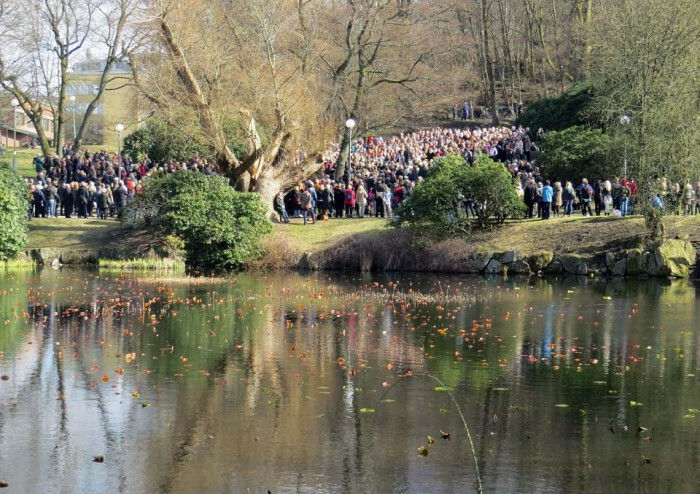 Valborg – celebrated every year on 30th April – is a traditional spring celebration. In many places this takes place in parks in the open air where choirs gather to sing in the spring. 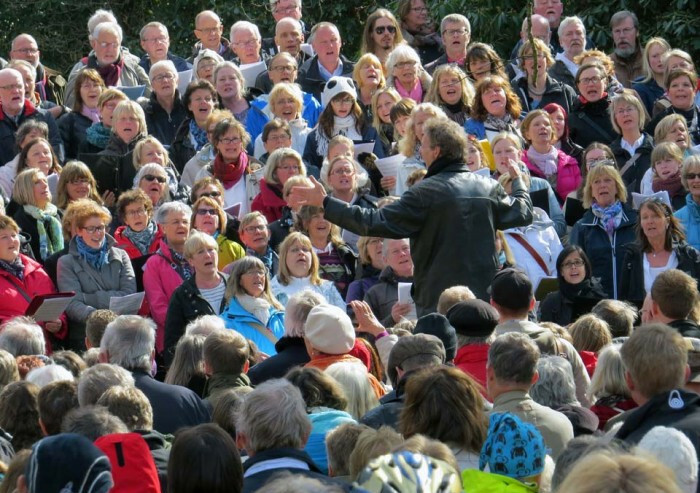 Singing in choirs is a popular pastime in Sweden and Valborg is an opportunity for many choirs to get out of the church or hall where they usually sing, into the open air. Here in Gothenburg the place to be is around the lily pond in the University Park. Then comes the special event that is peculiar to Gothenburg as far as I know: the Chalmers Cortege. A number of other university cities also have a similar special event. What we’d call a student rag day at home in England. Valborg is seen as a student’s day of celebration (perhaps because the choirs used to be school and college choirs) and that’s why universities get involved. The most famous of the Swedish Valborg events is probably the boat race on the river that runs through Uppsala. There, students from the University compete to get down the river through the city in boats of their own construction. 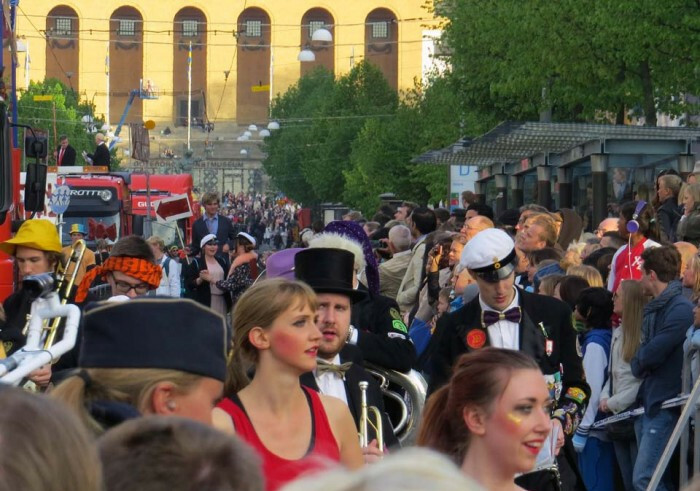 Here in Gothenburg the Chalmers Cortege is, I think, probably the second most well-known of the Valborg parades. Students at the Chalmers Technical University in Gothenburg have been constructing their floats for weeks in the parking lots on the old campus. Hammering, sawing and painting to the sound of loud music played through amplifiers. (Possibly to the annoyance of their non-student neighbours). Now they assemble and parade through the city and the population gather in the rain to cheer. I say in the rain because no matter how fine it has been earlier in the day, the Chalmers Cortege seems to attract the weather gods. Whether you see that as a blessing or as a curse probably depends on your state of inebriation. Which can be high. To be sure the weather does not always turn bad. This Sunday, for example it was even sunnier than the day, a few years ago, illustrated. But everyone expects the rain. After the singing and the student celebrations, in the evening, again in most places, there’s a bonfire. This is probably the oldest element of the celebrations. The Old Year is burned out and the New Year welcomed with cleansing flames. The following day, 1st May, is a day for the left-wing of the political spectrum to celebrate and demonstrate. In Sweden today there are at least five different political groups that like to announce their allegiance and concerns by parading through the streets. 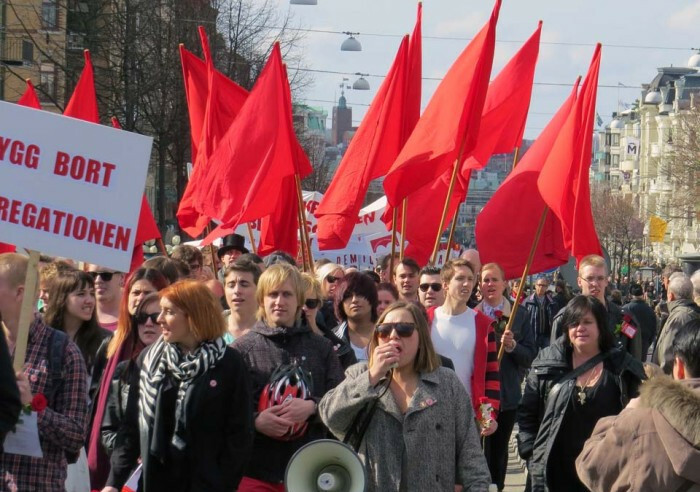 In Gothenburg that means a parade for the Social Democratic Party, the party in government in Sweden today. This is usually the biggest. The second most popular is often the Left Party parade. The Left Party collects the former Communists and still attracts enough votes in the country to hold seats in Parliament. These two groups are more or less part of the establishment. There are usually parades also for the Socialist Party (Trotskyists) , the Communist Party (formerly the Communist Party of the Leninist Revolution – the Maoists) and the Anarcho-Syndicalists. 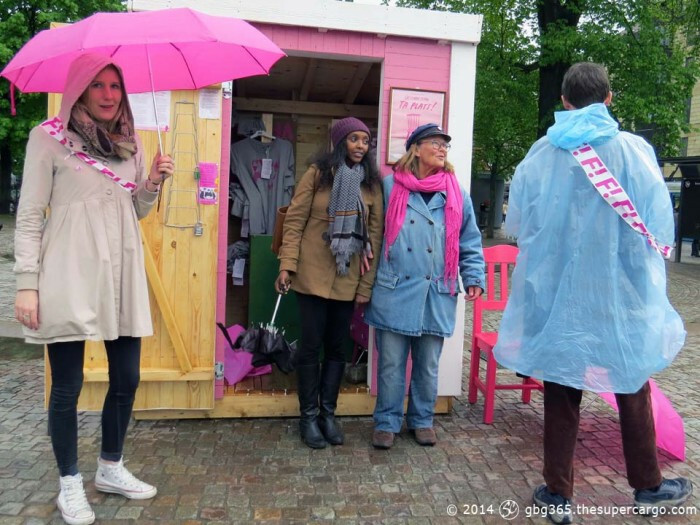 The relatively new feminist party, Feminist Initiative, also seems to regard itself as a member of the socialist bloc. I certainly saw quite a lot of FI badges and balloons around town this 1st May, although I didn’t see whether there was a parade or not. The demonstration parades gather at one point. Then they walk or march through town to another point where they hear speeches from honoured leaders and invited guests. There is some considerable logistical skill involved in keeping the parades from running into one another. Perhaps because, despite the chants for workers’ solidarity, there isn’t always a great deal of comradely love between the different groups. No doubt each separate group advertises its own plans to its own members, but that information doesn’t spread. You can probably find out if you know where to look on the social media. However if you are not particularly involved with the local social networks in your in the town, that can be a problem. I’m saying all this because I actually forgot what 1st May entails in Gothenburg. This year I took myself into town unaware. I wanted to take a photograph which I’d been planning but putting off for a number of days, but wherever I went in town there seemed to be blocked streets. The people were gathering and could not get through. In the end I gave up. 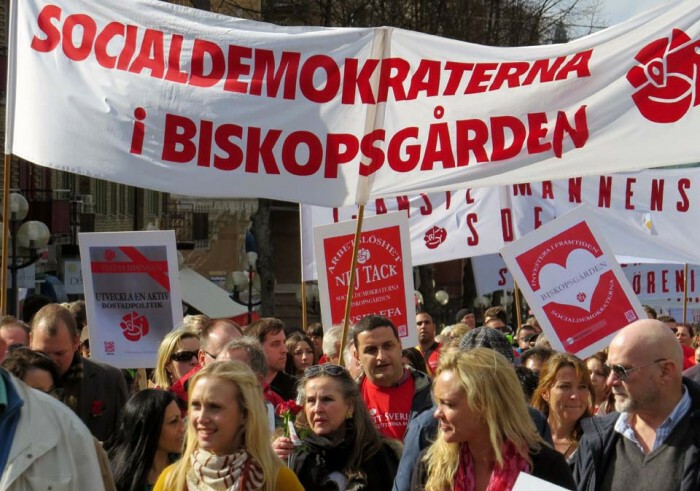 I retired to a café where, a little later, I had a view of the Social Democratic Party in parade, passing on its way. Tack för att du väckte minnena till liv.